Rump: The True Story of Rumplstiltskin by Liesl Shurtliff. Review: Have you ever wondered about a fairytale from the villain's point of view? Have you ever considered that the Big Bad Wolf might just be hungry, or that the three bears were just angry at Goldilocks? Or perhaps Rumpelstiltskin, the greatest villain of them all, who stole the queen's child, had more to his story? Indeed, the book, Rump: the True Story of Rumpelstiltskin, gives the whole story of Rump, the main character, as accounted from the imagination of the author, Liesl Shurtliff. Once upon a time, there lived a boy up on a mountain called The Mountain, in a magical kingdom called The Kingdom; the boy's name was Rump. In a land where a name foretells your destiny, the newborn child's name was whispered into his ear by his dying mother, then announced throughout the town by church bells and screaming gnomes, the one syllable forever sealing his fate. When, Rump finds his late mother's old spinning wheel, though, all his luck seems to change. Rump, much to his delight, can spin gold from straw. This gold turns out to be unlike any other, though; the gold Rump spins is magical gold. And magic, no matter how deceivingly harmless, always has it's consequences. With every piece of straw turned to gold, Rump weaves himself deeper and deeper into a curse older than he himself. There is one way to break the curse, though, Rump discovers. He must find a stiltskin, the deepest, purest form of magic. All odds are against him, but with a bit of luck, determination, and help and advice from his best friend Red, Rump could just succeed. A fascinating tale full of fantasy, adventure, and mystery, Shurtliff spins a story like Rump spins gold. I was hooked from the beginning, where the author started the story with a sense of humor unmatched by many other books I have read. "My mother named me after a cow's rear end. It's the village's favorite joke, and probably the only oneÉ" Rump's misery and discontent is easily relatable for people of all ages, and it's hard not to get attached to this brave and witty underdog. This story, though you may have guessed already from the title and synopsis, is an adaptation of the classic tale of Rumpelstiltskin, the story of a strange little man who promises to spin straw into gold for the queen in return for her first child. This fresh twist on the story is just as captivating and even more inventive, with the story from Rump's point of view, showing not only the perspective of the hero or heroine, but also the so-called "bad guy". This book would be enjoyed by pretty much all ages, I think, but I would especially recommend it to grades 4-7. 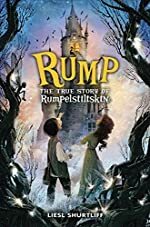 The captivating adventure, wittiness, and new twist on a classic fairytale make Rump: the True Story of Rumpelstiltskin a great book, 4.5 out of 5. We would like to thank Random House for providing a copy of Rump: The True Story of Rumplstiltskin for this review. Have you read Rump: The True Story of Rumplstiltskin? How would you rate it?